Learn. Grow. Shift. is an approachable, enjoyable and effective tool for personal growth. It will help you establish positive habits, engage in self-reflection, and work through 30 days of learning, growing and shifting in all areas of your life. Learning new things is essential for personal growth. Throughout the journal, you’ll be prompted to learn something new that's related to your daily work so you come away with a deeper sense of knowledge and understanding. Personal growth is the most important work we'll ever do. This journal will challenge you to grow in all areas of your life, from your perspective to your sense of self-confidence and your ability to relate to the world. You'll also grow into your path and life purpose. By taking the time to learn and grow, your entire perspective will shift. Just imagine the shift you'll create after 30 days! Start each day with a mantra, learn about its meaning, then apply it in a written reflection and accompanying practice (yoga, meditation, and other fun techniques). You’ll come away with a sparkling sense of self-assurance and an ability to step confidently into your power and your purpose. Are you living a paper-free lifestyle? We’ve got just the thing for you! Download the convenient Learn. Grow. Shift. editable PDF and enjoy all the benefits of this workbook on your computer, tablet or phone. As a big believer in self-awareness, mindfulness, meditation, and a solid yoga practice, I constantly seek new methods of sharing valuable wisdom and promoting personal growth so others can find their purpose, make their dreams a reality, and live a positive and fulfilled life. 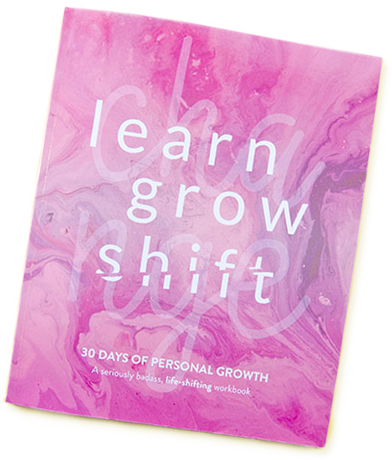 I created this workbook to help you learn, grow, and shift in all areas of your life. Know that when you show up and do the work, you have already set in motion the positive growth you seek. You have sent a message to the Universe loud and clear that you are attracting all the good, all the growth, abundance, light and love that you deserve. Writing this workbook made my soul sing. May completing it bring you the same peace and fulfillment. Beginning your day on a positive note is such a powerful way to set the tone for your day. You will feel more positive, confident, grounded, and present. This is why your workbook is designed to be your morning practice - it’s the way you’ll start your day for the next 30 days. Are you ready to embark on this incredible journey to personal growth?